netstat (network statistics) is a command line tool for monitoring network connections both incoming and outgoing as well as viewing routing tables, interface statistics etc. netstat is available on all Unix-like Operating Systems and also available on Windows OS as well. It is very useful in terms of network troubleshooting and performance measurement. netstat is one of the most basic network service debugging tools, telling you what ports are open and whether any programs are listening on ports. This tool is very important and much useful for Linux network administrators as well as system administrators to monitor and troubleshoot their network related problems and determine network traffic performance. This article shows usages of netstat command with their examples which may be useful in daily operation. Listing all ports (both TCP and UDP) using netstat -a option. Listing only TCP (Transmission Control Protocol) port connections using netstat -at. Listing only UDP (User Datagram Protocol ) port connections using netstat -au. Listing all active listening ports connections with netstat -l.
Listing all active listening TCP ports by using option netstat -lt. Listing all active listening UDP ports by using option netstat -lu. Listing all active UNIX listening ports using netstat -lx. Displays statistics by protocol. By default, statistics are shown for the TCP, UDP, ICMP, and IP protocols. The -s parameter can be used to specify a set of protocols. 1 packets to unknown port received. Showing statistics of only TCP protocol by using option netstat -st.
901848 packets to unknown port received. Displaying service name with their PID number, using option netstat -tp will display “PID/Program Name”. Displaying Promiscuous mode with -ac switch, netstat print the selected information or refresh screen every five second. Default screen refresh in every second. Display Kernel IP routing table with netstat and route command. Showing network interface packet transactions including both transferring and receiving packets with MTU size. Showing Kernel interface table, similar to ifconfig command. Displays multicast group membership information for both IPv4 and IPv6. To get netstat information every few second, then use the following command, it will print netstat information continuously, say every few seconds. Finding un-configured address families with some useful information. Find out how many listening programs running on a port. 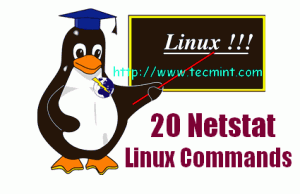 That’s it, If you are looking for more information and options about netstat command, refer netstat manual docs or use man netstat command to know all the information. If we’ve missed anything in the list, please inform us using our comment section below. So, we could keep updating this list based on your comments. Can I take this data for 1 hr. For example I want dump or data of this command from 1 PM to 2 PM. i want a software tools or hardware tools , for generating accurate url link of client or user of Network. We’ll have to check out such a tool. We hope you can wait a little as we try to find one. What is the best way to go about finding all ports being used by MySQL for clustering purposes? I am on Linux platform with MySQL NDB 5.7. I am trying to monitor all traffic related to MySQL clustering – between data nodes, management node and sql nodes. To that end, I used netstat to list all open ports listening on my machine before starting MySQL cluster. Then, I started MySQL cluster and ran netstat again. I assumed that the ports that were listening the second time around, but not the first time, were related to MySQL clustering. But there are two problems with this. First, there could be ports opened by other processes between the two netstat runs. Second, MySQL might open other ports after I ran the netstat command the second time. I believe ephemeral ports are picked dynamically, so perhaps if I knew all the MySQL clustering related processes that would be running, I can figure out every port that they are using. Pointers will be very welcome. This command will indicate the port number and process ID(PID)/program name as well.